I do realize that it’s Post-Election Day 2016 – 11-9-2016. Trump won. So as I’ve already stated before, I live in Hawaii and I recently bought a house in January. There are many things I want to do to renovate and fix up my house in next 5-10 years. However, I’ve placed a priority on getting a new roof and getting solar panels. Why? Well, here in Hawaii, electricity is very expensive. Also, we get some degree of sunshine pretty much 365 days of the year. These two factors make a strong argument for solar power. That’s a pretty significant difference. I don’t use all that much energy to power my house since I am in a relatively cooler area. For that reason I am able to not run the AC except for a few hours a day (more on weekends). However, my electricity bill is still between $250-$300 a month. This will only increase once my inlaws come in December. So, for those reasons, it’s pretty easy to see why Hawaii is a strong market for solar power. Solar power was adopted pretty rapidly, which involved a net metering program. This meant you could “sell” any excess power you made back to the grid. For some, their bills dropped to $0, and for others, they might have even made a little money. However, the grid for Hawaii was strained under this “new power” as there was nowhere for it to go. As such, Hawaii has since nixed the net-metering agreement. Those who already have it are grandfathered in (for now). I will be under the new agreement, being paid less for any excess power I generate. However, I don’t think I will have any real excess. The major “problem” with solar is that your panels generate the most power during the day when you are probably at work and don’t need the power. Then you come home from work and start turning on the AC, TV, and all the lights because it’s dark out… and your solar panels aren’t capturing energy anymore. So for those hours, you are still relying on the grid. This means that for most solar panel owners on the new agreement, the days of a $0 bill are over. Most likely, your bill will still be in the range of $80-100 a month. Of course, that is still less than then $300 you would have paid, but getting the return on investment (ROI) of a $15-25k (out of pocket, after tax credit) takes longer, probably in the range of 6-10 years. However, this makes the assumption that the prices for electricity stay the same, which may or may not be true. If the price of electricity goes up (likely), then ROI is better. If the price of electricity goes down (less likely), then ROI is worse. Ok, so what’s the plan then? So, the plan is I’m going to replace the roof on my house, and since I’m replacing the roof, I should try to get solar panels on at the same time. I’m hoping that by doing both at the same time that the chance for a leak or problems with the panels decreases. After a lot of deliberation, I opted for a metal roof because I plan to be living in this house for the foreseeable future with the solar panels. If you put down new asphalt shingle and solar panels, there is a possibility that the panels may outlast the shingles. Metal, while being more expensive, lasts longer (50+ years) and is a good base for panels if you go with “standing seam”. The panels themselves can just clamp on to the seams and you don’t need to penetrate the roof really (except for the conduit). I’ve planned it this way, to try to prevent leaks/problems before they start. We’ll see if it works out. The argument for going with a metal roof versus clay tile versus traditional asphalt shingle is a long one. Overall, the major downside to metal is the cost. If there is any interest, I will go over my thought process on why I went with a metal roof in a future post. I get it, but what about Tesla? Ah yes, Tesla. So Tesla and Elon Musk are kind of one and the same. When people think about Tesla and Elon Musk, they are mostly thinking about the cars. The cars, while nice, are not something I am interested in… yet. It doesn’t make sense financially in Hawaii currently because of the high cost of electricity. This may change as alternative energy solutions become cheaper, or if they ever decide to put a supercharger in. However, you may want to note that the supercharger won’t be free anymore for cars ordered after January 1, 2017. It also remains to be seen how the Model 3 is… and so far the Model X has been a disappointment. That said, I might be interested in a 2nd generation Model X if they fix some things. Overall, it’s pretty cool stuff. Elon is trying to make people adopt Solar Power while keep some similarity to the aesthetics of a roof people are used to. Now, do solar roofs matter to me? Not at all. I’m already putting on a new roof and panels. The likelihood of me removing my metal roof and panels to put on a solar roof in the next 20 years, or even 30 years, is pretty much zero. However, I am not the norm. Elon (and Tesla) are betting that in the next 5-10 years when people need to replace their aging asphalt shingle roofs (and no panels), that they can make prices reasonable enough to convert these people into buying a solar roof which acts like a new roof and panels in one. Essentially, they are trying to capture my market, the “I need a new roof, and maybe its time for solar too” market. We’ll see if that works out. Ok, so what do you care about then? What I actually care about in that presentation is the PowerWall 2. The original Powerwall, for the most part… sucked. It only had 7kWh capacity, which simply isn’t (and wasn’t) enough. Overall, it was a glorified back up generator, since it basically could only generate enough power for a few hours. To me, and to many others, the point of a battery is to go “off the grid“. The Powerwall 2 will have 14kWh capacity. Remember the above problem I talked about where you generate all this energy during the day that you don’t really need, and then when you really need it, at night, you don’t have it? Batteries can solve this problem. During the day, your solar panels generate energy while you are at work and store most of it in the battery. (You will still have power the “necessities” like your fridge, etc.) You come home and turn all your electricity sucking items on… which then gets electricity from… your battery. Now how much energy do you need stored in order to do that? That will of course depend on your AC usage, house size, number of people in your house, etc. which will factor into your overall energy usage. If you use Tesla’s little “estimator”, you can assume ~30kWh a day for a 4 bedroom house. If you want one day of backup power for the entire house, then you will need two Tesla Powerwall 2s, which would cost $12000 for both ($6000 each). So are you going to buy two Powerwall 2s then? $12000 is still a lot of money. Going back to my calculations above, I will probably pay around $100 a month for electricity once I have the the Solar Panels on. The return on investment for having two batteries would be, at best, $100 a month x 12 months a year = $1200 a year x at least 10 years. Now, if Tesla rolls out a 20kWh or 30kWh Powerwall 3 at a decent pricepoint in the next few years (and I fully expect they will), then it may be time to move to batteries. Powerwall was for very early adopters and Powerwall 2 will appeal to people who live with spotty or irregular power outages, or who are already “off grid”. I think that a “Powerwall 3” with its likely increased capacity and lower cost, will be the battery that appeals to many of us in here on Hawaii. This isn’t to say that Tesla doesn’t have competitors, such as LG Chem RESU and SonnenBatterie eco. However, with the announcement of the Powerwall 2, they are now behind. Competition is good and I hope these companies will step up and push each other to make higher capacity batteries more affordable, sooner. I’m putting on a Metal Roof and Solar Panels. They just make sense in Hawaii. 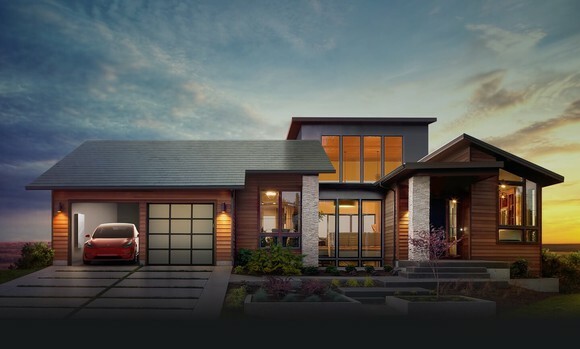 I’m not convinced on Solar Roofs yet… but if Elon has his way, every new house will have one. I think batteries are the future, but just not yet.